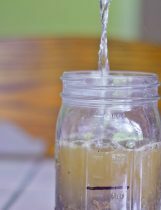 Learn how much water your soil can hold by testing garden clay content with a DIY test (soil fractional analysis) to measure clay, sand, and silt in the soil. 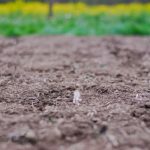 There is a simple procedure that shows precisely how much clay your soil contains. Every gardener should do this test if for no other reason than to know what their soil profile is to at least three feet deep. “Dig a hole. If you have a soil auger, the hole doesn’t need to be any larger in diameter thn the tool. Otherwise, neatly excavate a short, hip wide ditch that is at least 36 inches deep. It is normal to find more than one sort of soil below any field. The first 6-12 inches, the topsoil layer, are usually darker in color because they contain almost all the organic matter. Sometimes the same sort of soil particles continue down further, but become lighter in color. Typically, in climates where there is more than about 30 in. of rainfall a year, and also in soils that developed slowly out of the rocks they sit atop, you’ll encounter a change as you dig, almost as though the land were a layer cake. Below some point you will find a layer of clay. In dryer climates this may not occur. If there is such a change then take a pint sized sample of both types or all three types if there are three distinct soils as you go down. Ask yourself a question as you dig: Is this soil loose enough, friable enough, that roots can penetrate it? As you dig are you finding roots? Some soils, especially some clay subsoils, are so dense and airless that almost no roots can exist in them. If you run into that sort of clay, there is little point in going deeper; in fact, in that kind of soil it will be difficult to dig further. 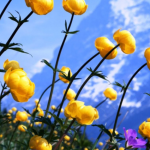 If you’re gardening on alluvium (soil deposited by flooding rivers or creeks) instead of an upland soil, and if as you dig you run into a layer of nearly pure gravel, there is also no point in going deeper. Few plants will be able to root through it, and gravel serves as a complete barrier to moisture rising to the surface by capillarity- your garden will require considerable irrigation. It just so happens that while moving the garden my husband also had to move the fence posts which required digging pretty deeply so I had some deep soil that I could sample for this experiment. Otherwise, you certainly wouldn’t have found me out there with a shovel digging down three feet! Using a sample from one of the holes, we performed a soil fractional analysis test as a fun and different homeschool experiment. With samples in hand, the next step is to do a “soil fractional analysis” test. Don’t be daunted by the big name. It’s a piece of cake. 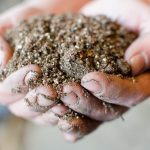 The idea is to determine the makeup of your soil by breaking it into constituent particles and finding out how long they stay suspended in water. The smaller the soil particle, the longer it will stay suspended in water. Clay particles are so tiny that only the most powerful microscope can see one, and they stay suspended in water for many hours, sometimes days. The main thing we want to know is how much clay there is mixed into the larger particles of your soil. To do the test, get a quart canning jar or something similar with a good lid. Take about one pint of soil, remove any roots or small rocks, break it up as finely as possible, and put it in the jar. Get a felt pen that will write on glass and mark on the side of the jar where the top of the soil comes to. Alternatively, stick a strip of adhesive tape on the glass and mark the top of the soil on the tape. Now fill the jar with water to within about one inch of the top and add a teaspoonful of ordinary dishwashing detergent- a low suds type is best, but low-sudsing is not critical. Seal the jar and shake it hard. And shake. And shake some more. Now shake really hard. Shake for five to ten minutes. 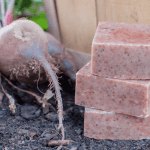 Shake until every particle of soil in the jar that had aggregated (formed clumps that resist coming apart) has been separated from every other particle (this is the reason for the soap). Now comes the measurement. Stop shaking and immediately put the jar down in bright light, say on a windowsill. Wait exactly two minutes, by the clock, from the moment you stopped shaking. Then look closely, using a bright flashlight if necessary to see into the murky water. Unless what you’ve been shaking is pure clay, some of the soil will probably have settled out and will be resting on the bottom. That deposit is your “sand fraction”. Mark the depth of the sand fraction on the side of the jar. Now go away for a while, but come back exactly two hours after you stopped shaking, take another look and make another mark. What settled after the first two minutes but within two hours is the silt fraction. Silt particles are finer than sand but are still just tiny broken and rounded-off bits of rock. At this point, all that remains suspended in the water is the clay and maybe the organic matter. Clay can take a long time to settle out- days, sometimes weeks. 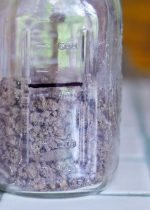 If you wanted perfect accuracy you’d waity until the water was clear and then make another line, but practically speaking the first mark you made, showing where the dry soil came to when you first filled the jar will be close enough. If the clay fraction settles within 12 hours, that’s a good sign you have a relatively coarse sort of clay. Any soil that contains much fine clay will be harder to work with. So now you know that you have so many inches of sand, so many of silt, and so many of clay. Calculate the percentage of each. Run this test on each soil layer you encountered when digging your hole. 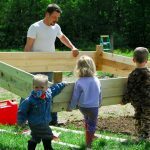 One benefit of knowing the percentage of each type of soil in your garden is that the mix of soil particles indicates how much water that soil can hold for the benefit of growing plants. A sand soil is defined scientifically as one with less than 10 percent silt or clay. A medium soil could be any mix of sand and silt that has at least 20 percent clay, but less than 35 percent clay. If it contains no more than half clay, it can be an excellent soil to grow a garden in. If it is more than half clay, it can be a difficult soil to work. Which is much less clay than I would have bet on. I would have guessed us to be much closer to the 50% mark so I’m quite pleased with these results and am very happy to see that we have pretty decent soil making our work in the garden a bit easier! *All quotes are taken from Garden When It Counts by Steve Solomon. For my complete thoughts regarding this book, you can read my review here. This really is interesting! You seem to have good soil there… And I also thought to myself at first, “My goodness! She’s out digging around at 41 weeks pregnant!” 😉 Hope you’re doing well! this is so neat! We will have to try it when we study soil! Although I really came here to see if you had the brand new babY!!!!!!!!!!! SO EXCITED FOR YOU!!!!!!!!!!! Enjoy all your activities until the baby comes!!!!! Wish I were closer to come help you!!!! Hi Tara! Nope no baby yet 😀 Trying to remain cheerful even thought waiting is hard. I’ve had a couple of false starts- my poor children awoke this morning so disappointed to learn there was no baby. I was convinced last night it was time (they really hurt!) but then they went away when I went to bed. My husbands pretty ticked he has to go to work tomorrow- he’s come to count on me to have my babies on the weekend so he doesn’t have to go in. I told him I’m holding the baby hostage until the garden is all planted. Too bad it’s going to rain until Wednesday. So maybe next weekend- at least that’s what I’ll tell him! !